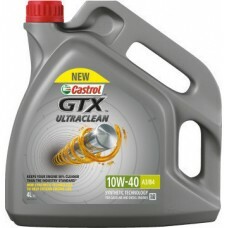 Castrol GTX 10W-40 A3/B4 fights sludge, the engine cholesterol! Castrol GTX 10W-40 A3/B3 provides 25% better protection against sludge than the latest industry standard. Liquid Engineering protects against problems that your engine faces every day. Sludge build-up in your engine can lead to increased deposit formation, reduced oil flow and premature engine failure.